Tourist Information Centre Walk 49 at Winterton to Martham Broad01493 846346work Walking RouteIf you fancy a longer walk and to see more of the rural area why not try this walk from Winterton-on-Sea to Martham Broad via East Somerton. You will pass places of historical interest along the way with amazing views across the reed beds and keep your eyes peeled for the rich variety of birds and wildlife that can be seen along the way. Take a short diversion into Martham Village and stop at the Kings Arms situated by the village pond for refreshments and maybe a spot of lunch before you continue your journey. Public facilities can also be found just along from the pub. If you fancy a longer walk and to see more of the rural area why not try this walk from Winterton-on-Sea to Martham Broad via East Somerton. 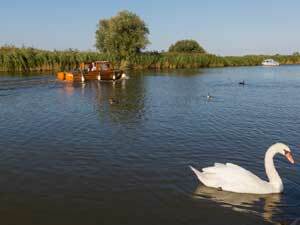 You will pass places of historical interest along the way with amazing views across the reed beds and keep your eyes peeled for the rich variety of birds and wildlife that can be seen along the way. On arrival in Winterton, the walk starts in the car park at the end of Beach Road.